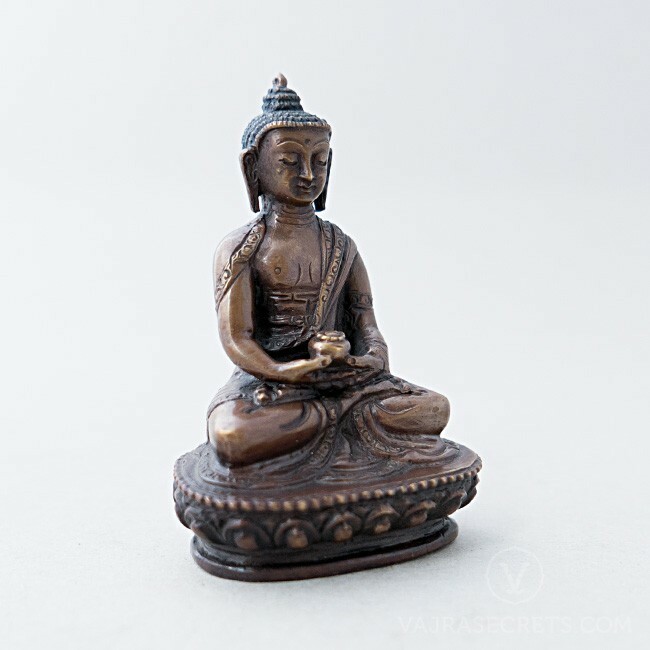 An exquisitely hand-carved copper statue of Amitabha, the Buddha of Infinite Light, revered by Pure Land Buddhists around the world. A perfect addition to a small shrine at home or in the workplace, or as part of a portable travel altar. 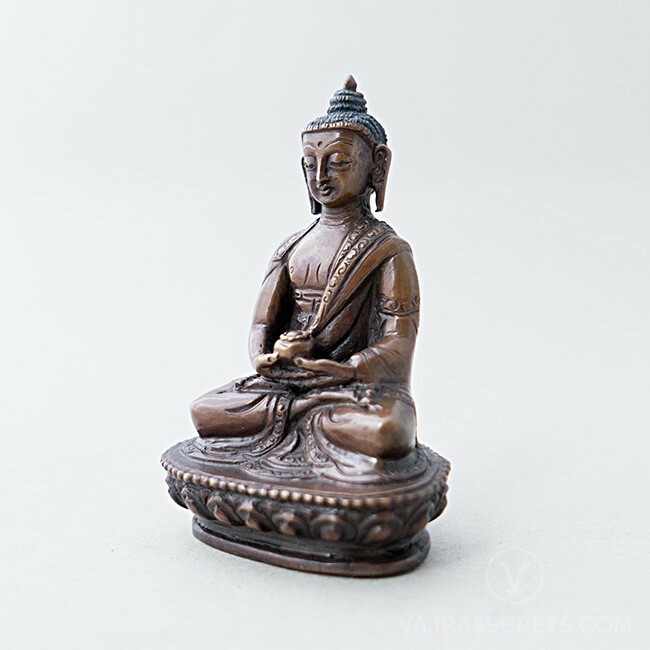 A 3.5-inch oxidised-finish copper statue of Amitabha, the principal Buddha in Pure Land Buddhism. Hand-carved with full iconographic detail according to traditional scriptural sources, this is a perfect addition to a small shrine at home, in the workplace, or as part of a portable travel altar. 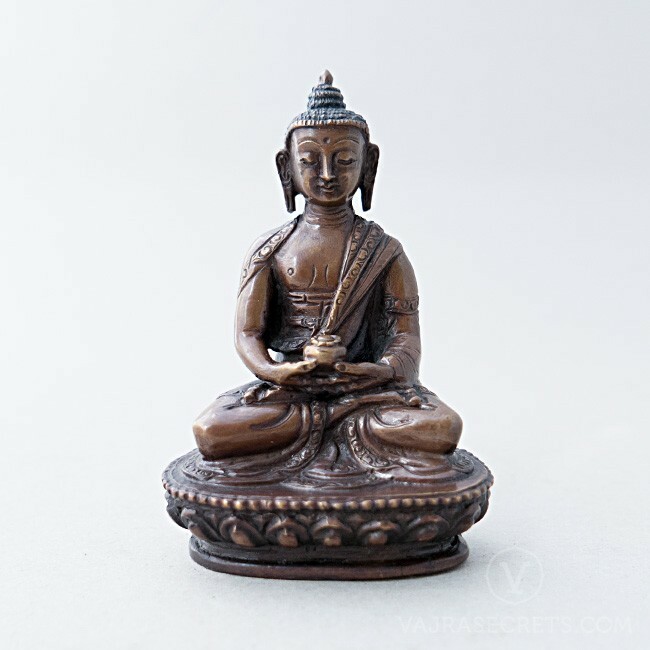 Adored throughout eastern Asia, Amitabha is also known as the Buddha of Infinite Light. His practice is favoured for its simplicity and his devotees pray to be reborn from a lotus in his Western Pure Land, Sukhavati. His image brings the blessings of love and compassion to all who see it and plants the seeds of Buddhism in their minds. Red in colour, Amitabha is dressed in the robes of a monk. His hands are in the dhyana or meditation mudra, symbolising mercy and wisdom, and he holds a begging bowl filled with the nectar of immortality. His personal symbol is the lotus, representing gentleness and purity. The embodiment of light, he bestows the Wisdom of Discrimination to combat desire. This Amitabha statue can be personalised with a hand-painted face using real gold dust or insertion of mantras and holy items. One can also offer traditional brocade clothing, pearls and semi-precious stones, as H.E. the 25th Tsem Rinpoche always encourages the practice of making offerings to the Three Jewels, which creates the causes for us to attain the six paramitas (perfections).